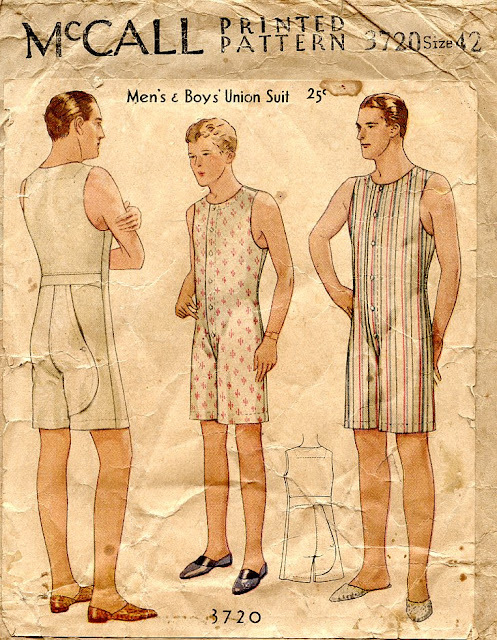 This short-legged version of the union suit doesn't seem to show up much past the 1920s. I'm still waiting for an expert on vintage men's underclothes to stumble across this blog and explain all the things that I can't quite fathom. 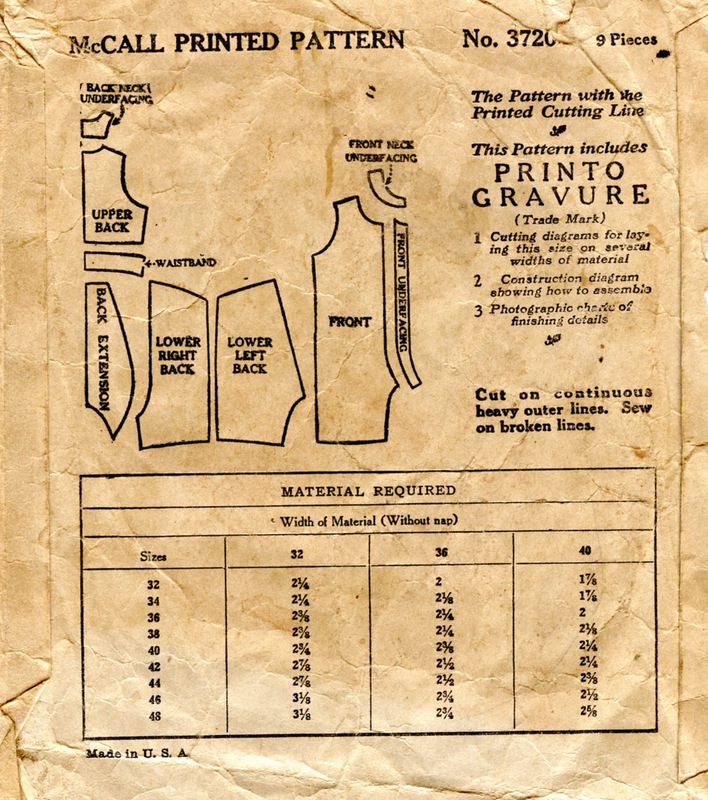 One of my Women's Institute books of this same period recommends that if making these in quantity, one buy a knit men's undershirt and cut it up to use for the back waistband. This is an extremely sensible idea. It's interesting to see this garment made up in prints and stripes. From a sartorial perspective, was it acceptable for a gentleman's print undergarment to show through his white shirt? 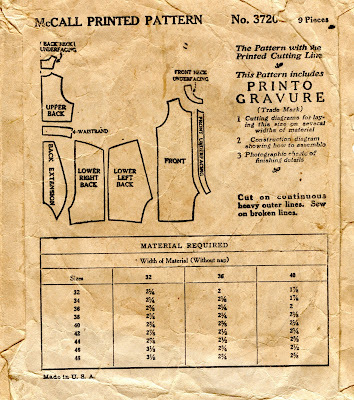 At this time McCall didn't offer a separate instruction sheet, but printed some minimal instructions on the pattern pieces themselves, must as Pictorial Review did. A gentleman's print undergarment will never show through his shirt because a gentleman never takes his coat off in company. With the possible exception of picnics. When I was growing up, my dad was very active in the Communication Workers of America (CWA) with the local telephone company. One evening he was leaving for a union meeting and I, at the ripe old age of five or so, asked if I could go along. "No, darling, it'll be too late at night for you." "But Daddy, I already have my own union suit!" Five year olds are very logical beings, in their way. Of *course* one would wear a union suit to a union meeting. How Marvelous is your blog! And might I add thanks for posting about union suits. I'm a designer myself and have been working on concepts for Neo-victorian/ vintage underwear and union suits. I've never come across anything showing patterns, as you mentioned yourself, and the side leg flap is quite a novel and ingenues approach to the often bulky drop flap. Glad you're enjoying the offerings. If you haven't already, you might also want to look at Economy 4617. I think the two undershirts have terrific neo-Vic/Steampunk/Guttersnipe potential. Hello! I would love to have a copy of this pattern! Is this possible? I have looked and looked and looked for a pattern like this and have not found one! HELP! My email is skuhn11@gmail.com Please email me! I saw the comment from Stephen ... are copies of this pattern available anywhere? 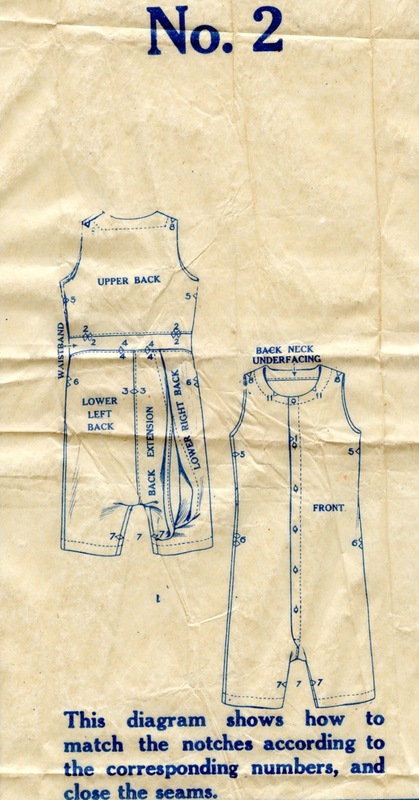 I'm not aware of copies of union suit patterns being available. If you have access to eBay, you should be able to pick up a pattern in a month or so, as they do come up pretty regularly. The section you want is Collectibles --> Sewing --> Patterns --> Men. 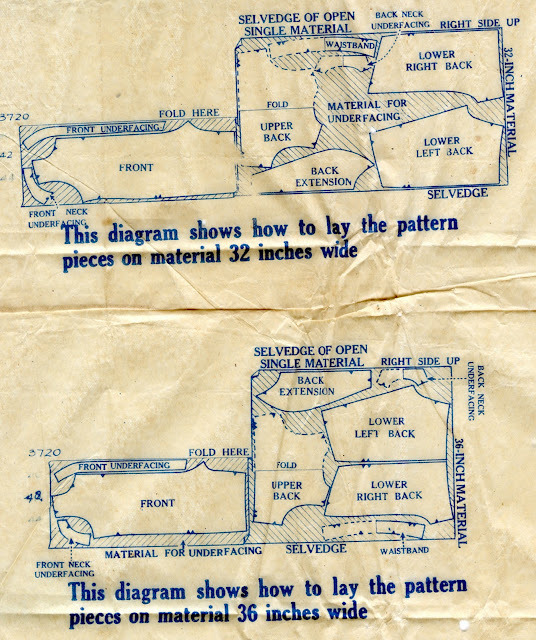 Another section to try is Antiques --> Sewing --> Patterns. Also keep an eye out for patterns for men's undershirts and drawers, particularly from the 1930's. These also show up pretty regularly, and from these you could construct a union suit by cutting the undershirt off just below waist level and sewing it to the waistband of the shorts. My grandfather, a farmer in the US South, wore this kind of undergarment all of his adult working life, as far as I can tell, into the 1970s or early 1980s. I think Sears sold this garment for a long time after it was fashionable and then my grandfather wore these until he wore them out. Great pattern.